There is no menu this week since we are half the week in California and half the week in Utah. In California we will be in eat-down mode and in Utah we will be needing to see what we have in the refrigerator and freezer and going to the store. It is a fun problem to have. 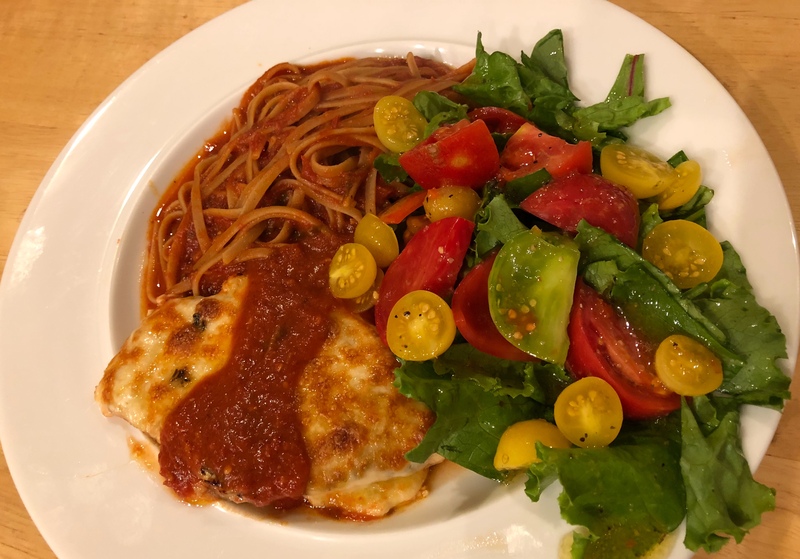 Chicken Parmesan is a good eat-down food for us because we get to use up the spaghetti sauce that our daughter made from her copious tomatoes plus we get to eat some lingering salad greens with more tomatoes! We do not bread and fry our chicken to cut down on calories. Our dish is sauteed chicken breast which we finish under the broiler with some mozzarella. We boil up some whole wheat linguine, and toss together a salad. Except for too many pots and pans to wash, this is a pretty simple but tasty dinner. This entry was posted in Easy, Italian, Pasta, Poultry, Vegetables and tagged chicken, green salad, Linguine. Bookmark the permalink.